These days, most tourists want to use their cell phones in India, especially now that smartphones have become so essential. After all, who doesn't want to post constant updates to Facebook to make their friends and family jealous! However, there are some important things that you need to know. This is particularly so for anyone coming from the United States because India's network operates on a GSM (Global System for Mobile Communications) protocol, not a CDMA (Code-Division Multiple Access) protocol. In the United States, GSM is used by AT&T and T-Mobile, while CDMA is the protocol for Verizon and Sprint. Hence, it may not be as simple as just taking your cell phone with you and using it. Like Europe and most of the world, the GSM frequency bands in India are 900 megahertz and 1,800 megahertz. This means that for your phone to work in India, it must be compatible with these frequencies on a GSM network. (In North America, the common GSM frequencies are 850/1900 megahertz). Nowadays, phones are conveniently made with tri bands and even quad bands. Many phones are also made with dual modes. These phones, known as global phones, can be used on either GSM or CDMA networks according to user preference. So, you have the necessary GSM phone and you're with a GSM carrier. What about roaming with it in India? Make sure you thoroughly investigate the roaming plans on offer. Otherwise, you could end up with a shockingly expensive bill when you get home! This used to particularly be the case with AT&T in the United States, until the company introduced changes to its international roaming services in January 2017. The new International Day Pass enables customers to pay a fee of $10 per day to access the calling, texting and data allowed on their domestic plan. The $10 per day can quickly add up though! To save money, especially if you're going to be using your cell phone a lot, the best solution is to have an unlocked GSM phone that will accept the SIM (Subscriber Information Module) cards of other carriers, and to put a local SIM card in it. A quad-band unlocked GSM phone will be compatible with most GSM networks worldwide, including India. However, US cell phone carriers usually lock GSM phones to prevent customers from using other companies' SIM cards. In order for the phone to be unlocked, certain conditions must be met. AT&T and T-Mobile will unlock phones. You can possibly jailbreak your phone to get it unlocked but this will void its warranty. Thus, ideally, you will have purchased a factory unlocked phone without a contract commitment. The Indian government did start provided free kits with SIM cards to tourists arriving on e-visas. However, this has now been discontinued. Prepaid SIM cards, with a maximum three months validity, can be purchased inexpensively in India. Most international airports have counters that sell them. Alternatively, try cell phone stores or the retail outlets of phone companies. Airtel is the best option and offers the widest coverage. You'll need to buy separate "recharge" coupons or "top-ups" for "talk time" (voice) and data. However, before you can use your phone, the SIM card must be activated. This process can be very frustrating and sellers can be reluctant to bother with it. Due to the increased risk of terrorism, foreigners need to provide identification including passport photo, photocopy of passport details page, photocopy of Indian visa page, proof of home address in country of residence (such as driver's license), proof of address in India (such as hotel address), and a local reference in India (such as hotel or tour operator). It can take up to five days for verification to be completed and the SIM card to start working. Ideally, it's best to buy the SIM from the area you'll be staying in. If it doesn't activate, you can easily go back to the place you got it from and complain. What About Getting a Roaming SIM in the US? Plenty of companies offer SIM cards for people traveling overseas. However, most of their rates for India are high enough to deter you, even if you don't want the hassle of getting a local SIM in India. The most reasonable company is iRoam (formerly G3 Wireless). See what they offer for India. Don't Have an Unlocked GSM Cell Phone? Don't despair! There are a couple of options. Consider buying a cheap GSM phone that's unlocked for international use. It's possible to get one for under $100. Or, only use wireless Internet. Your phone will still connect over WiFi without any problems and you can use Skype or FaceTime to keep in touch. The only problem is that WiFi signals and speeds are highly variable in India. 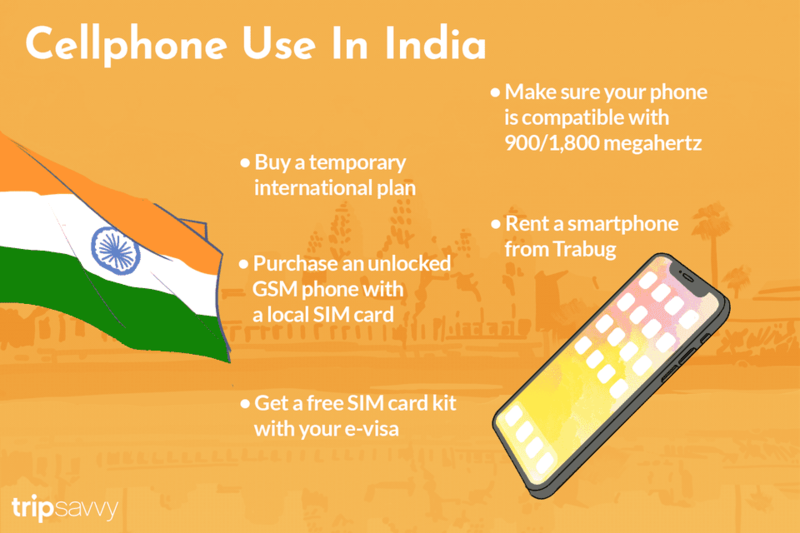 If you're only coming to India for short-term travel, you can avoid all the above hassle by renting a smartphone from Trabug for a set period of time. The phone is delivered for free to your hotel room, and will be waiting there when you arrive. When you've finished with it, it will be picked up from the place you specify, before you leave. The phone comes ready to go with a local pre-paid SIM card that has a voice and data plan, and is powered to provide 4G Internet connection. It also has apps on it, for access to local services and information (for example, booking a cab). The cost varies depending on the plan you choose. The Mega Plan, with an allowance of 1.2 gigabytes of data a day, costs $2.99 per day plus a $9.99 delivery charge. This is enough to meet the needs of most users. It also gives 120 minutes of free calls within India and five text messages per day. If you require more data, go for the Ultra Plan with 2.50 gigabytes of data a day. You'll also get 250 minutes of free talk time within India and 10 texts. The cost is $3.99 per day plus a $9.99 delivery charge. All incoming calls and text messages are free, even if they're international. Due to Indian government regulations, it's not possible to rent the phone for more than 80 days. Trabug now offers rental of personal WiFi Hotspots as well. These are suited to people who want to use the Internet only on their own devices. The cost is $2.49 per day for 1.2 gigabytes of data, plus a $9.99 delivery fee. Or, $3.99 a day for 2.50 gigabytes a day. If you want to make calls or send texts, go with the travel phone. A refundable $65 security deposit is also payable on all rentals.